One New Aftermarket Replacement Tachometer (White Needle Version) made for John Deere Tractor models: 3010, 4000, 4010, 4021, 4320, 4520, 4620, 5010, 5020, 6030, and Industrial model 700. 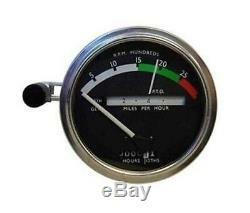 All with Gas / Diesel Syncro Range Transmission PLEASE NOTE: This Tachometer comes in 2 different color styles. Please look closely at the picture. This listing is for the WHITE Needle Version only, which was used from 1968 and Up. The RED Needle version was only used up until model year 1968. Part Numbers RE206855 (White), AR45444, AR30143, AR39908, AR39906, AR32833, AR48021, AR50402, AR26718. Only the 48 contiguous States in the U. The item "RE206855 Tachometer with White Needle for John Deere Tractor 3010 4000 4010 4021" is in sale since Tuesday, November 08, 2011. This item is in the category "Business & Industrial\Heavy Equipment Parts & Accs\Antique & Vintage Equip Parts".